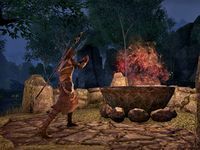 Help protect Greenshade from Daedra. Rootwater Grove — Restore peace to Rootwater Grove. I'm helping the Wooded Eye prevent Daedra from escaping Rootwater Grove into Greenshade. Talk to the priest Orthenir. Enter Ilmyris and find the Hall of Memories. Watch the vision and receive your reward. The forest is angry due to an impending Daedric invasion. You activate three wardstones around the grove to protect it. However, you are too late to stop the invasion. Orthenir reveals that the grove is home to a secret library of Herma-Mora. You go to Ilmyris to bind the Daedra. Inside, you find the Hall of Memories, Saromir and a shrine to Hermaeus Mora. You defeat the Khajiit, the Altmer and the Imperial souls, which were set free when their bindings were loosened. The Bosmer soul escaped, and you can choose to replace the soul with Saromir. If you choose to kill him and have the persuasion perk, you can convince Saromir to kill himself. If you refuse to kill Saromir, Hermaeus Mora will kill Orthenir instead, and you must defeat his soul. Once a soul has been provided, Hermaeus-Mora provides you a vision of Pelidil and Prince Naemon. They found the Heart of Valenwood at Hectahame. Return to the shrine for your reward.